LOVE! 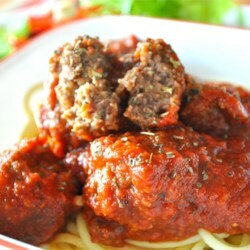 I've never been 100% satisfied with any meatball recipe until now. The kick from the crushed red pepper and hot sauce really make these something special. I served them on hoagie rolls with sauce and cheese. Delicious. I might even go so far as to say that they deserve a fist pump.... ;) Thanks LTH!